Deanne Williams is a Professor of English at York University, Toronto. 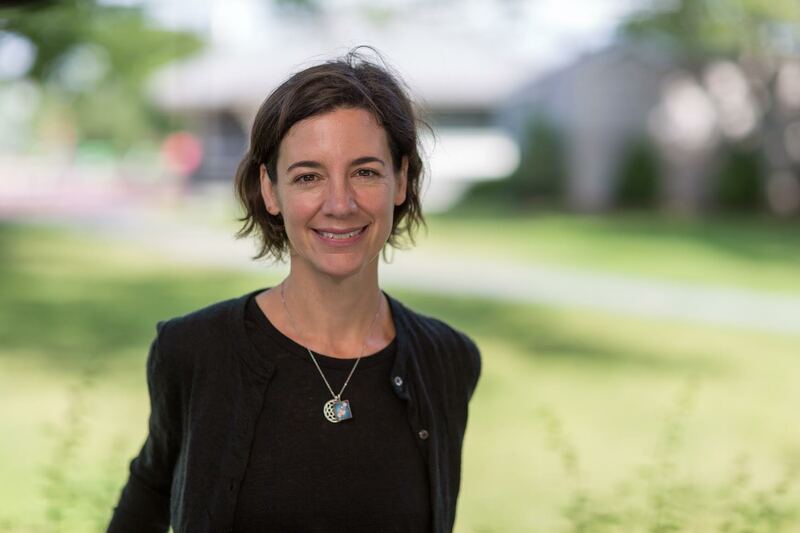 Her research focuses on Medieval and Renaissance literature, especially Shakespeare. For more information about Deanne, please click here. Shakespeare and the Performance of Girlhood is the first scholarly study devoted entirely to Shakespeareʼs girl characters. Revealing the dramatic and cultural centrality of the young girl in early modern English culture, and highlighting the ‘girlʼ as a distinctive category in Shakespeare, this book locates Shakespeareʼs girl characters and representations of girlhood at a pivotal moment in the history of girlhood as an identity and social condition. 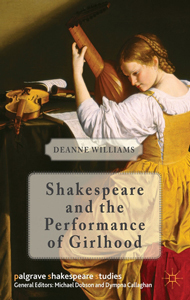 Illuminating Shakespeareʼs girl characters in their relationship to earlier historical discourses and representations, and charting the development of Shakespeareʼs construction of the girl as a dramatic and literary figure throughout his career, Deanne Williams demonstrates that Shakespeareʼs girl characters are consistently and self-consciously invested in performance, from playing dramatic and musical parts, to performing public and domestic roles. 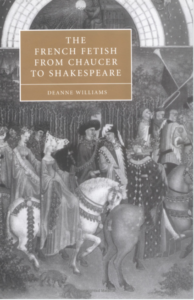 Calling attention to the influence of Shakespeare and his girl characters on girl performers, patrons, and playwrights, Williams makes an original contribution to the history and culture of the early modern girl. This book is available from Palgrave Macmillan and Amazon.ca. Read Nadia T. van Peltʼs review of Shakespeare and the Performance of Girlhood for The Journal of Northern Renaissance. Read Janice Vall-Russellʼs review of Shakespeare and the Performance of Girlhood for Cahiers Élizabethians. Read Charlotte Scottʼs review of Shakespeare and the Performance of Girlhood for Shakespeare Survey. Read Tyler Sasser’s review of Shakespeare and the Performance of Girlhood for Early Theatre. What did childhood mean in early modern England? To answer this question, this book examines two key contemporary institutions: the school and the stage. The rise of grammar schools and universities, and of the professional stage featuring boy actors, reflect the culture’s massive investment in children. In this collection, an international group of well-respected scholars examines how the representation of children by major playwrights and poets reflected the period’s educational and cultural values. This book contains chapters that range from Shakespeare and Ben Jonson to the contemporary plays of Tom Stoppard, and that explore childhood in relation to classical humanism, medicine, art, and psychology, revealing how early modern performance and educational practices produced attitudes to childhood that still resonate to this day. This book is available from Cambridge University Press and Amazon.ca. 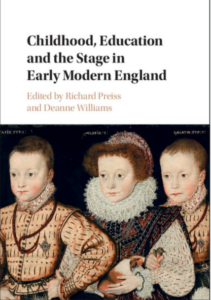 Read Harry R. McCarthy’s review of Childhood, Education and the Stage in Early Modern England here. Read Henry S. Turner’s review for Recent Studies in Tudor and Stuart Drama here. Read Edel Lamb’s review for Renaissance Quarterly here. Read Imhan Sheeha’s review here. Read Marlis Schweitzer’s review here. 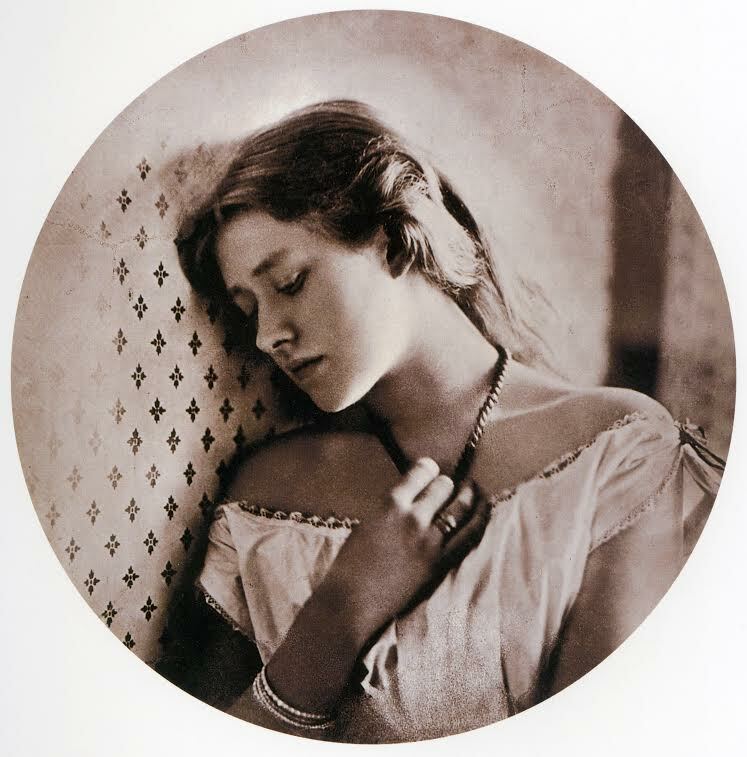 Although she appears in only a handful of scenes in Hamlet, Ophelia is one of Shakespeare’s most enigmatic and unforgettable characters. This collection of new essays is the first to explore the rich afterlife of one of Shakespeare’s most recognizable characters. 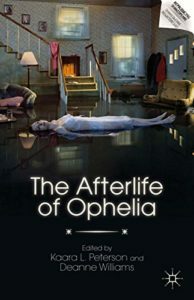 With contributions from an international group of established and emerging scholars, The Afterlife of Ophelia moves beyond the confines of existing scholarship and forges connections among fields that are typically pursued as separate lines of inquiry within Shakespeare studies: film and new media studies, theatre and performance studies, historicist and contextual perspectives, and studies of popular culture. This book is available from Palgrave Macmillan and Amazon.ca. What was the impact of the Norman Conquest on the culture of medieval and early modern England? Deanne Williams answers this question by contending that not only French language and literature, but the idea of Frenchness itself, produced England’s literary and cultural identity. Examining a variety of English representations of and responses to France and “the French” in the work of Chaucer, Caxton, Skelton, Shakespeare, and others, this book shows how English literature emerged out of a simultaneous engagement with and resistance to the pervasive presence of French language and culture in England that was the legacy of the Norman Conquest. Eagerness to appropriate the status of French culture, along with the desire to establish a distinctive identity apart from it, produced a fascinating and conflicted set of negotiations and disentanglements. Drawing upon current theories of gender and postcoloniality, this book revises traditional notions of English literary history by inserting France as a primary element in English self-fashioning, from Chaucer’s Prioress to Shakespeare’s Henry V.
Read Theresa Coletti’s review in Speculum. This book is available from Cambridge University Press and Amazon.ca. This collection of original essays is dedicated to exploring the intersections between medieval and postcolonial studies. Ranging across a variety of academic disciplines, from art history to cartography, and from Anglo-Saxon to Hispanic studies, this volume highlights the connections between medieval and postcolonial studies through the exploration of a theme common to both areas of study: translation as a mechanism of and metaphor for cultures in contact, confrontation, and competition. 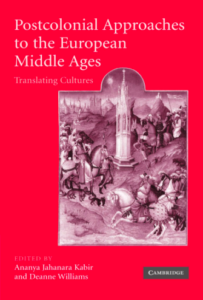 Drawing upon the widespread medieval trope of the translation of empire and culture, this collection engages the concept of translation from its most narrow, lexicographic sense, to the broader applications of its literal meaning, “to carry across.” It carries the multilingual, multicultural realities of medieval studies to postcolonial analyses of the coercive and subversive powers of cultural translation, offering a set of case studies of translation as the transfer of language, culture, and power. Read J.J. Cohen’s review in Notes and Queries. Read Christine Chism’s review in University of Toronto Quarterly.